28-Aug-2013 -- This is visit 2 in a series of 7 CP visits while on a short road trip with my son Michael from 28 to 30 August 2013. Again following the navi we headed out of Slovakia and into Hungary. We knew the CP was on the edge of Balaton lake and eventually we arrived there and parked at a nearby car park by the railway line. After a few minutes walk along the railway line, we crossed it and headed into the reeds towards the CP. We knew from the reports from other visitors that this would not be one of those 'all zeroes' visits. And so it proved. 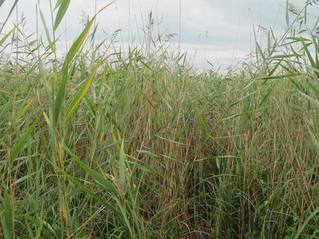 We headed through the thick reeds, avoiding wet patches when possible, and decided after a few metres that to try to get much closer was pointless - we would not reach the CP and if we did would trample metres and metres of reeds. So we stopped at about 83 metres from the CP which with the 2 metres GPS accuracy would put us within the required 100 metres. The usual photos were taken and we headed back to the car. We did try to find a route from the South-East side, but came across private property, and signs that even in a language we did not understand did not look inviting. By this time it was already early evening and we had planned to get to N46 E15 in Slovenia but that was some distance away. We headed South along the lake - around 9 p.m. still miles from Slovenia we found a hotel in Keszthely on the southern end of the lake and called it a day. The next day we headed for N46 E15. #9: Keep out or else?